It’s no surprise that the Balearics are so well known for their coastline. The island’s shores are home to turquoise waters, secluded coves and bustling beaches. But there’s a lot more to these islands if you dig a little deeper - not in the sand of course! Unless building a sandcastle is a holiday tradition you just can’t resist? Cobbled streets, castles and caves might be music to the ears of any adventurous holidaymakers. And if you’re a history buff, heading to each island’s historic towns and cities should be your first port of call. The beauty of a Balearic Islands villa holiday is having the freedom to explore whatever you like, however you like. Dive into our Balearic Islands holiday guide below. 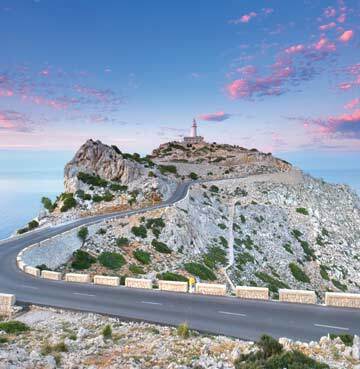 Mallorca’s mountains are the ideal place to appreciate the island’s natural beauty. If you love the great outdoors, a trek through the Tramuntana range will feel like hiking heaven! From its charming villages to wonderful greenery, there’s so much to see. Maybe you want the views without all that walking? Then drive straight to Cap de Formentor, at the very tip of Mallorca. A lighthouse sits at the cliff-edge, towering over the Mediterranean Sea. With the craggy cliffs all around it’s one of the finest spots in Mallorca! If you love watching the sunset, head here in the early evening. If you prefer exploring cities, move Palma to the top of your list. The Old Town is the perfect spot for some Balearic culture. Take your pick from medieval buildings, monuments and fascinating architecture. The Gothic cathedral is a must-see, sitting pretty beside the Mediterranean Sea. You can always take a watching brief and just enjoy the atmosphere. Palma’s pavement cafés are seemingly tailor-made for people watching. And if you’re just itching to get to the beach, golden sands and turquoise waters are there waiting for you! Palma is just the tip of the Balearic’s cultural iceberg, you’ll find two amazing cities waiting to be explored on Menorca’s shores. Mahón (also known Maó) is the island’s current capital. The Mediterranean’s largest natural harbour is one of the main reason’s it stole Ciutadella’s crown. So why not take a boat trip around Mahón’s seafront? You’ll spot Gothic and colonial influenced buildings that give you a great feel for its past. Don’t feel too sorry for Ciutadella – there’s lots going on here as well. Besides, the changing of the capitals happened almost three hundred years ago! So we’re sure there’s no hard feelings today. Visit the main square, home to the Gothic town hall and obelisk dedicated to those that battled against Turkish invaders. You’ll find amazing views over the charming port too. Perhaps you can pick out a spot for lunch before you head off? The seafood here is fresh and delicious – the perfect treat for your taste buds. 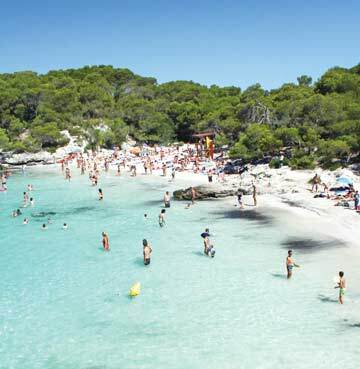 It’s hard to talk about Menorca without showing a little love to the Balearic beaches. Son Bou is the island’s longest – so it’s ideal if you’re looking for somewhere to spread out. Like many of the beaches here, families will feel right at home. Maybe you’re searching for something a little quieter? Find the peace you crave at Cala Turqueta and Cala Trebaluger, these picture-perfect beaches offer golden sand and turquoise waters. This is the Balearic Islands that beach-lovers fantasise about! There’s just one more historic town with a tale to tell – Ibiza’s Old Town. ‘Dalt Vila’ is a hidden gem on an island best known for partying. Swap the clubs for the cobbles here and discover the story of a town that suffered invasion and conquer. You’ll spot signs of this as you enter through the drawbridge, guarded by statues of Roman soldiers. The towering cathedral is the finest example of it’s diverse past, with a mix Gothic, Valencian and Catalan influences. It’s well worth a trip to the top of the Old Town, even if architecture’s not for you. There’s amazing views over Ibiza Town and out to sea. The glistening Mediterranean Sea is captivating. It might even tempt you down the coast to its mesmerising beaches. Cala d’Hort is most likely to cast a spell over you. Tucked away behind the cliffs, you’ll find golden sand and turquoise waters – ticking all those beach boxes. 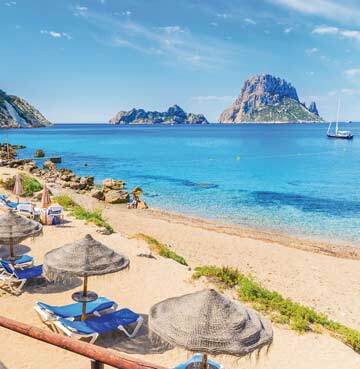 The towering Es Vedra rock sits close to Cala d’Hort’s shores too, offering spectacular views. If you’re feeling a little peckish, be sure to head to one of the nearby restaurants. With stunning views over the bay and Es Vedra – there’s not too many better spots for lunch with a view. Mallorca might spring to mind when it comes to Balearic Island caves, but Ibiza is home to its own set of impressive tunnels. The Can Marca Caves were once used by smugglers, although you’re unlikely to find any treasure stashed here today. You might feel like you’ve struck gold when you set eyes on the underground waterfall, where an amazing light show takes place. A trip here promises more of those amazing coastal panoramas too – so be sure to add it to your Ibiza itinerary.